Craft a study plan that works for you. Bar exam prep often comes bundled together in expensive packages, full of books, lectures, and other things students may not need. Below is a list of study resources that allow you to create an effective, tailored study plan. AudioOutlines: Innovative legal study aids, tailor-made for audio, to help students learn and memorize the critical black letter rules of law. 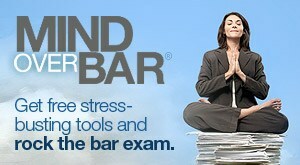 Mind Over Bar: Mind Over Bar is the only bar course focused entirely on the mental challenges faced by bar takers. Fleming’s Fundamentals of Law: Fleming’s Fundamentals of Law offers six different bar exam review courses, so you can choose the one that best suits your study needs. Bar Exam Toolbox: A great resource that helps repeat and first-time bar exam takers pass the bar exam. BarIssues: BarIssues provides law students with the only existing searchable database of all legal issues tested on the California Bar Exam since 2001. If you would like $20 off BarIssues (either the $99 six-month or the $149 full-year plan), email us for a coupon code! LLM Bar Exam: The LLM Bar Exam program is designed to give each student individualized attention, from the start of the course until the day of the Bar Examination. Anki: An app to create powerful, self-designed flashcards. Critical Pass: Bar exam flashcards that will help you pass the bar exam, written with key MBE concepts & elements to help you memorize for the MBE. Law Dojo: A family of legal game apps for law students & legal aficionados to learn all kinds of law in quick, delightful ways. LeanSheets: LeanSheets streamlines the most important and frequently tested information for each subject into only 2-3 pages. Make This Your Last Time: With their “Approsheets” and “Magicsheets,” MTYLT delivers comprehensive outlines for MBE and essays. Vinco: Proven strategies for the bar exam, including one-on-one tutoring. Law School Toolbox: Tools and resources for law students to get great grades and survive law school in style. LawTutors: LawTutors provides focused one-on-one in-person, distance and small group tutoring to bar students. FindMyLawTutor: FindMyLawTutor provides several tutors, available at one easy to use website. If you are interested in partnering with Esqyr, click here.